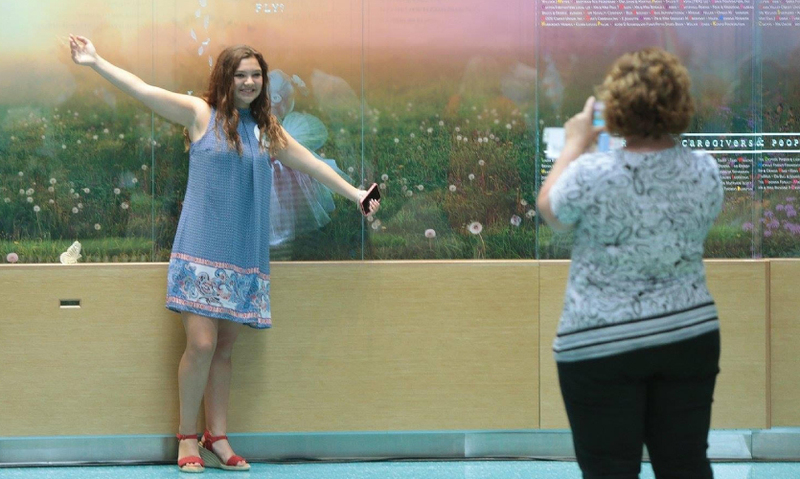 Dayton Children’s Hospital has a new donor wall designed and built by Amri Studio. 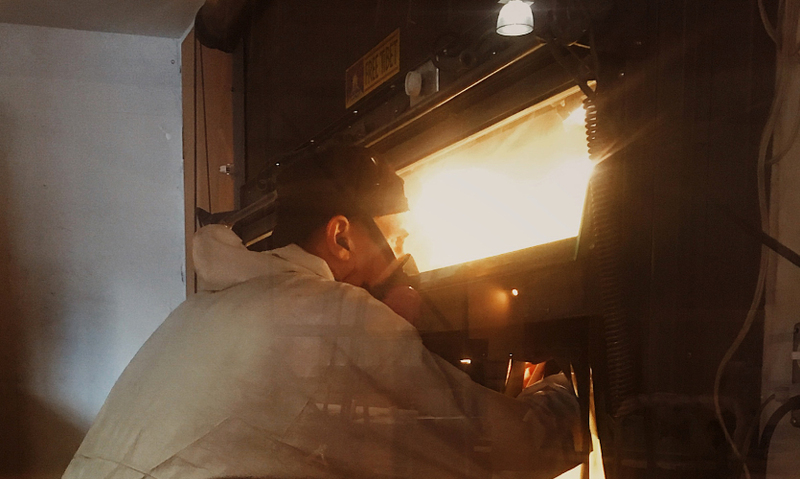 One of Amri Studio’s glass carvers, Ben Merton, in a state of deep concentration while delicately shading the etched “flying” creatures. 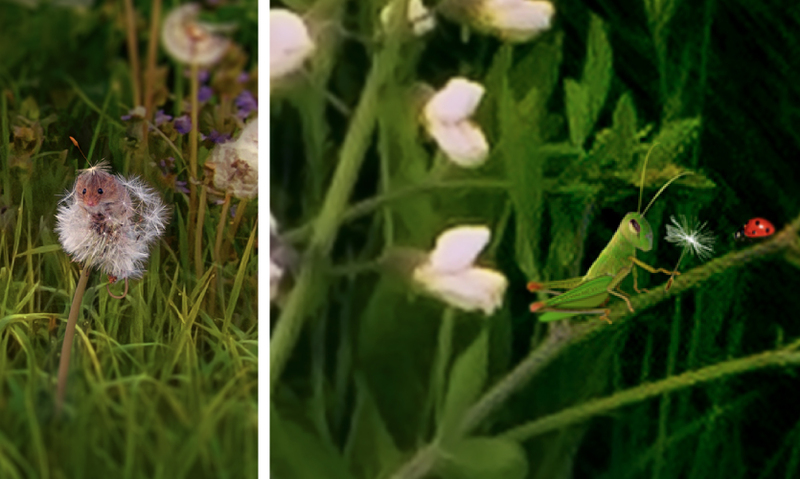 Tucked throughout the highly detailed, illustrated Huffman Prairie art backer are several hidden animal vignettes for children to find, inspiring delight and great conversations about philanthropy and community building. Studio staff review the finely printed dibond art backer in-studio for any necessary last minute changes before installation. To create the etched girl holding the jar of possibilities, Amri Studio’s illustrators carefully photo composited a little girl photographed by Rebecca Humes, wings made in studio and a photo of a child from the studio neighborhood. 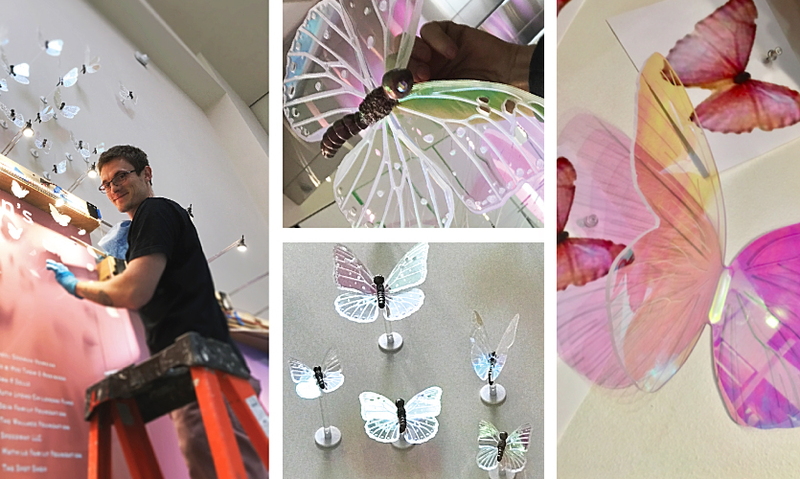 Three-dimensional, iridescent acrylite butterflies “fly free” above the glass wall right out into the lobby! 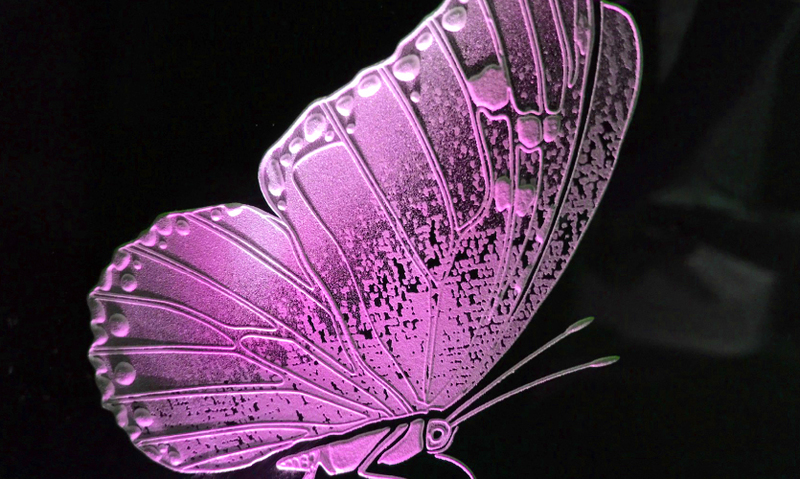 As the viewer changes position, the wings change color as though fluttering. 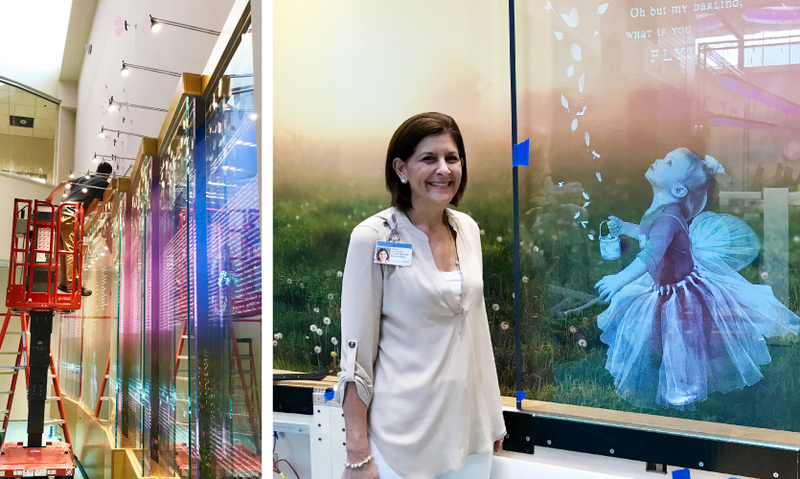 Debbie Feldman, President and CEO of Dayton Children’s, visiting the installation. 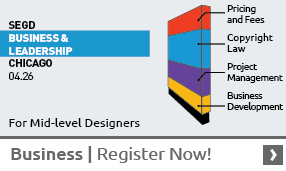 Collaboration with the Foundation was a key part of the design process. The wall shows the Dayton giving community of over 900 donors as a unified whole. Happy donors find their names from the color coded giving community. Different giving levels were each given their own bright color and brilliantly screen-printed onto high-polish acrylic panels. Dayton, Ohio, now an aviation technology hub, has had a long history with flight, starting with the Wright brothers who called Dayton home. The city is also home to Dayton Children’s Hospital,which is the only pediatric hospital in the region, employing 1,950 staff and seeing over 280,000 patients per year. The institution has grown and expanded in recent years, adding several new care facilities and realizing a major revitalization of surrounding areas including extensive landscaping, signage and wayfinding efforts.1 In the summer of 2017, the hospital put the final touches on another improvement plan that included an eight-story patient tower and a new donor recognition system. An impressive, high-ceilinged atrium/lobby was built into the new tower with the intentions of being a light, airy and art-filled space. 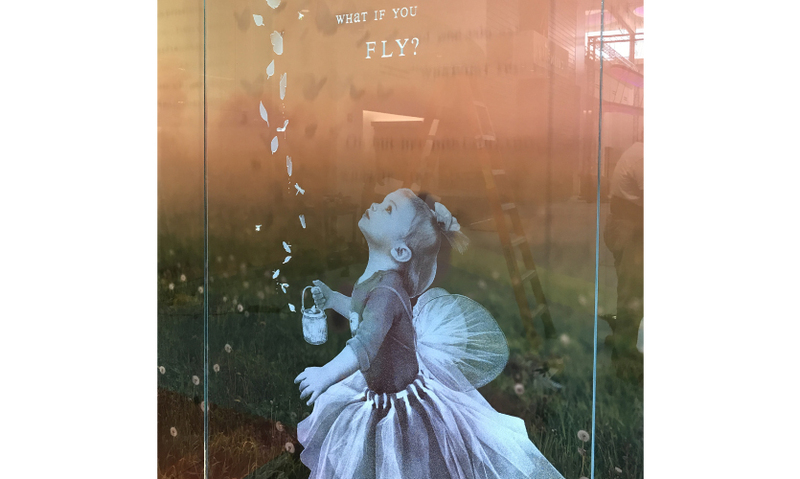 In particular, the hospital leadership wanted artworks and a consolidated donor recognition system that would embody the uplifting theme of “fly free” in a way both appropriate to scale and for viewers of all ages. 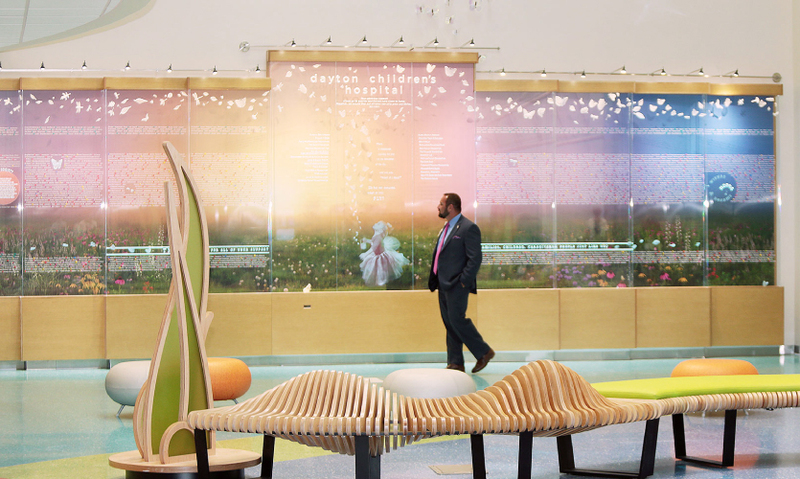 In pursuit of that goal, they sought the help of Amri Studioafter seeing the Studio’s donor recognition wall for Boston Children’s Hospital. 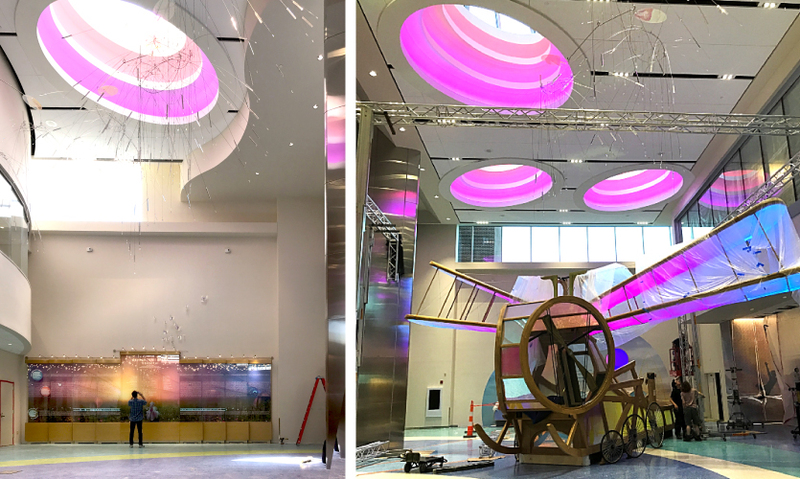 “The client group had an art consultant and were equipped with many exciting ideas for artwork installations in the lobby,” remembers Christina Amri, Founder of Amri Studio. The existing donor recognition was signage based and spread throughout the facility in smaller pieces, without much room to add new donor names. The hospital wanted something inspirational to blend the recognition of contributions from different historical donors and giving societies totaling over 900 acknowledgements into one unified philanthropic wall with plenty of available space for new names. Generosity and community building were values they wanted to express in addition to finding a beautiful and engaging way to say “thank you.” Additionally, they wished to provide some welcome distraction for patients and families in the space in concert with other art-and-play installations in the atrium, like the enormous “Dragonflyer” climbing sculpture. 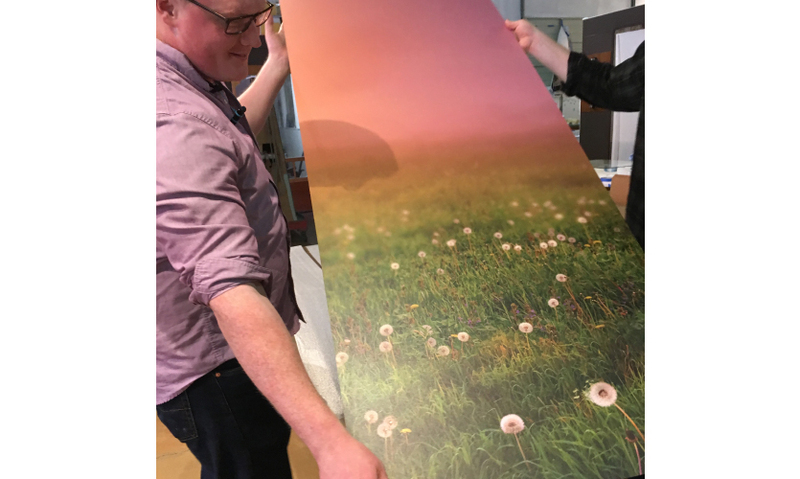 The feeling of that image with its innocence, hopefulness and sense of wonder became a central part of the visual the design team was creating—a magical springtime view of local Huffman Prairie Flying Field, where the Wright brothers practiced with early planes. Luckily Amri studio found a close image of a small “universal” child that also charmed the Leadership team—and that struck the absolute right chord with them. Amri Studio team scoured the Internet for the author of the image, who happily gave them permission to use it for the project, but there was a problem: The arm position and the hair weren’t going to work. 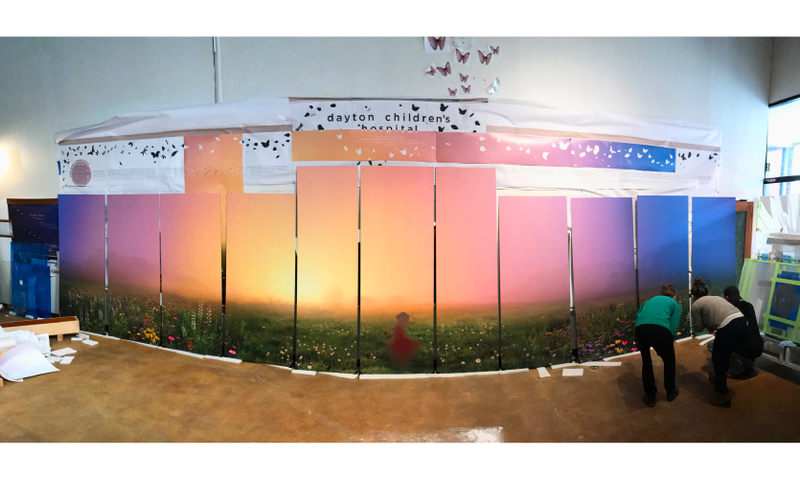 The completed image panels were printed directly onto Dibond using a four-color process. To meet the client’s important dedication dates the whole fabrication process was completed under a compressed timeline of less than three months, including the cabinet, programmed light fixtures and carved crystal glass. 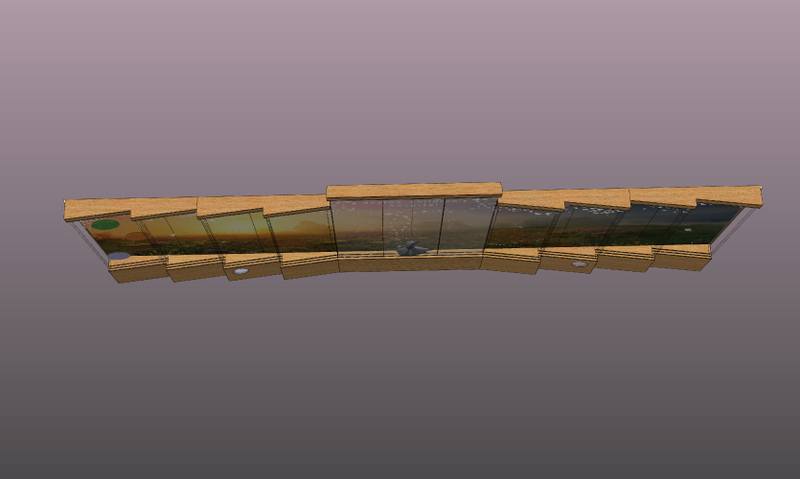 The Amri Studio team structured the 3-D wall installation in layers for artistic value and ease of updating. The oak cabinetry zigs and zags out at progressive angles from the center, creating a sort of “curving embrace” toward the viewer. The cabinetry holds three layers of graphics in multiple panels: a Dibond mural layer, a layer of crystal glass with v-carved and etched names and art (listing million-dollar-plus donors) and a layer of high polished acrylic panels with easy-to-update screen-printed names using a playful color coding of last name initials. The lighting, however, is what brings the wall to life in a dynamic way. Specially programmed LED lighting activated by a proximity sensor creates the illusion of several of the carved butterflies pumping their wings, changing color and quivering. 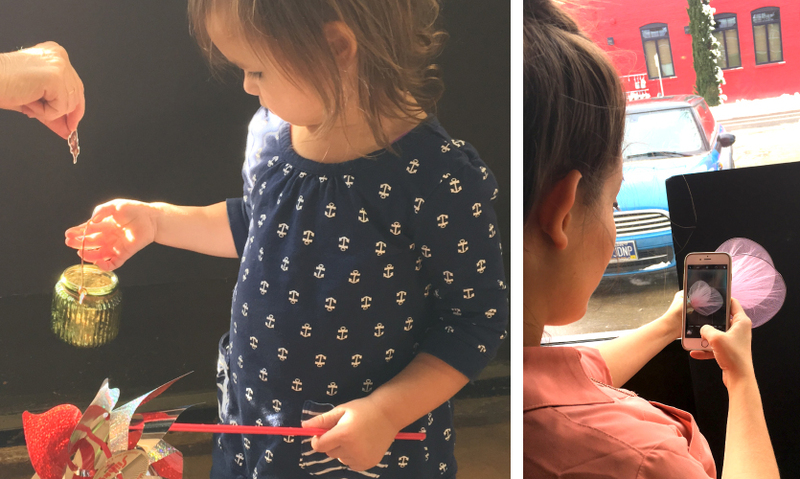 The sequence was planned, built and hand-coded by Amri Studio’s engineer and artists and although it lasts only seconds, viewers of all ages love engaging with it. 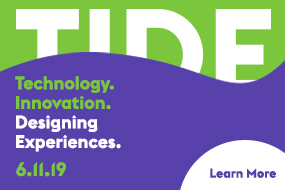 Effects like it are a signature of the studio, which has done similarly “interactive” installations at several children’s hospitals nationwide. Something new for the team was the integration of 3-D sculptural elements. 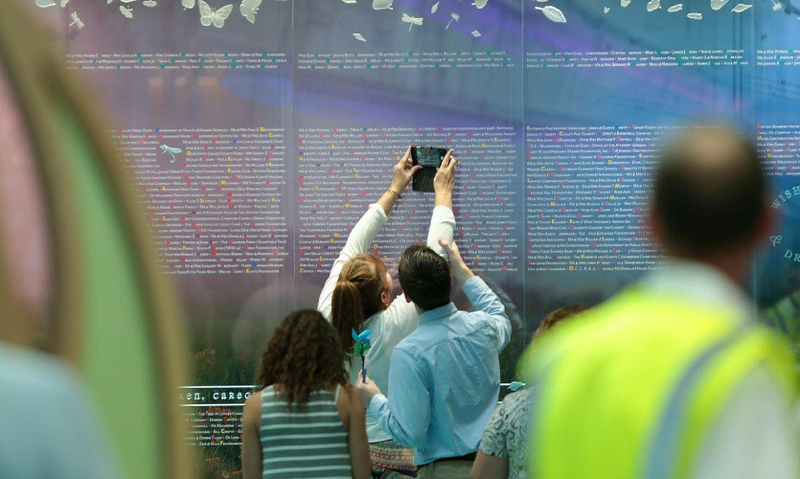 They created 16 iridescent Acrylite butterflies that “emerge” out of the top of the donor wall. Depending on the viewing angle, the appearance of color shifts from shiny clear to soft pinks and purples, giving the illusion of movement in accordance with the donor wall’s lighting effect. The final result has been very well received and has been beneficial to staff and patient morale—even moving some to tears—while honoring the generosity of donors in a way that encourages further gifting.